Idea has started offering its customers a new Prepaid Plan offering 84 days validity along with 1 GB data per day (total 84 GB). Just a couple of days ago, Reliance Jio revised its prepaid plan either by reducing the validity of existing plans or by introducing new plans with same benefits as old plan but at a higher price. Idea 398 Plan is direct take on Reliance Jio’s revised 399 Plan that now offer 70 days validity & 70 GB data. Idea 398 Plan is offering 84 days validity with 84 GB data (1 GB data per day) along with Unlimited Local & STD Calling. 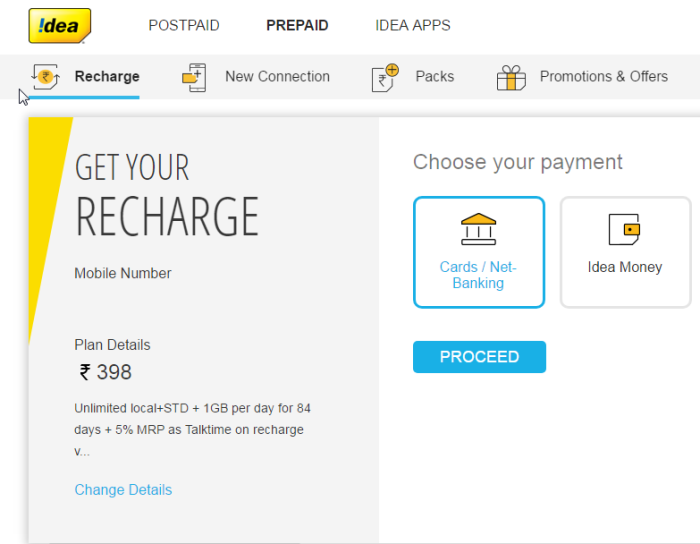 Idea 398 Plan is available to its prepaid customers and not for the postpaid customers. Even tough the Idea 398 Plan is not listed anywhere but it is available as Special Offer which can be availed by dialing *121# or installing MyIdea App. Idea 398 Plan – If not available on your number? If Idea 398 Plan is not available on your Idea as Special Promo Offer, do not recharge with Rs. 398. In case you recharge with Rs. 398, you will just get Unlimited Local & STD calls with only 1 GB data per day for just 14/30 days. You will not get any benefits like 84 GB data or Unlimited Calls for 84 days. Idea 398 Plan – How to Recharge? On MyIdea App – You can install MyIdea App and confirm and recharge Idea 398 Plan at the same time. Visit this link to install MyIdea App. On Idea Website – You can visit this Idea website and confirm and recharge Idea 398 Plan on your number. You can visit on this link and enter Idea your number to know more. Offline Retailer – You can visit nearest retail shop selling recharges etc and recharge with this plan but confirm it first before recharging it as already discussed above. Online Retailer – You can recharge with this pack on PayTM, MobiKwik etc if it is available on your Idea number. But we would recommend recharging it on Idea Website as shared above. Under Idea 398 Plan, Outgoing Calls during Roaming would be charged at Standard Roaming Tariff and only Incoming Calls would be Free. 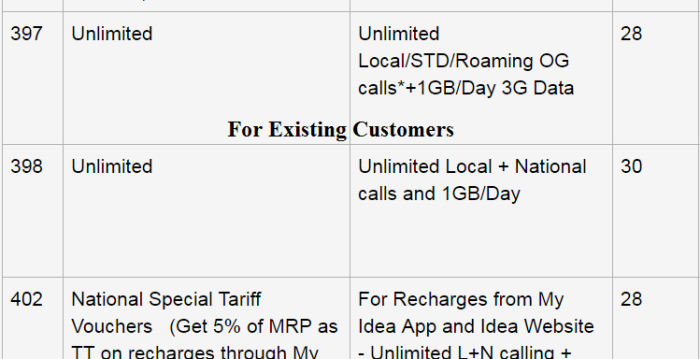 Idea 398 Plan – Available in Roaming? 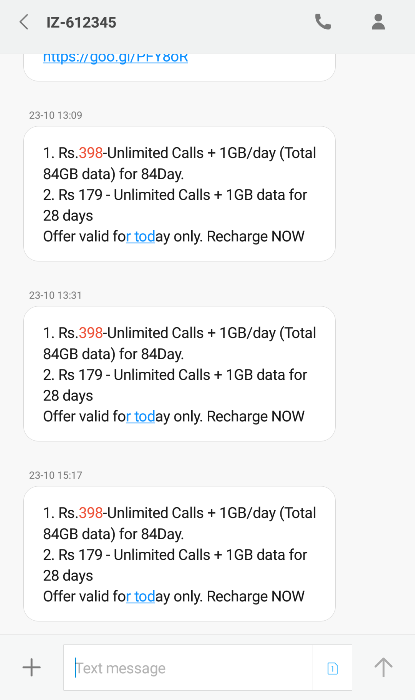 Yes, you can use Idea 398 Plan in Roaming as well. Incoming Calls in Roaming would be completely Free but you will be charged standard roaming rates for outgoing calls in roaming. Also you will not be charged extra for using Data (1GB per day) in roaming but you need to stay on Idea’s network to avoid charges. Idea 398 Plan – Alternatives? BSNL 333 Plan – BSNL offers 3 GB data per day under its BSNL Triple Ace Plan and it was recently revised and validity was reduced to 56 days. Jio 399 Plan – Reliance Jio also launched its Jio 399 Plan offering All Local, STD & Roaming calls for 70 84 days along with 1GB data per day.